Terry Pratchett stand aside, and the spirit of P.G. Wodehouse raise your cup of tea in acknowledgement of a new master of wit: Nigel Edwards’s masterpiece, Badger’s Waddle, will be published Thursday, 9th May. This is a book that manages to be both terribly polite and scandalously rude at the same time. Please, do not attempt this at home. If you have a Kindle or means to read a Kindle book (there are free Kindle readers for iPad, iPhone, PC, Mac, and Android) then stand down your purchasing finger and watch our website instead as we will be running a free promotion on Amazon within a day or so of launch. 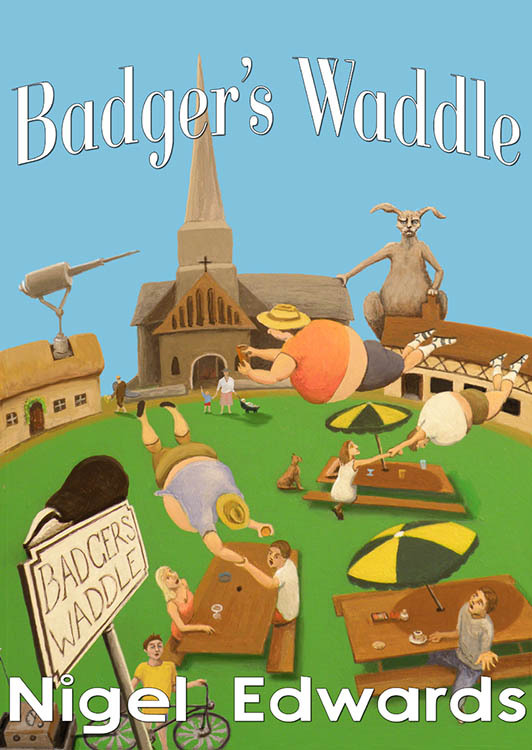 For more information, you can head over to the Badger’s Waddle page. I recommend clicking on the paperback cover at the bottom to get a close-up look at the hand-painted artwork from Dean Harkness depicting scenes from the book. This entry was posted in Book launch, Promotions and tagged british humor, British humour, douglas adams, free kindle book, terry pratchett, tom holt. Bookmark the permalink. The only book I’ve ever read that made me laugh loudly, and feel slightly nauseous at the same time. A brilliant read… unputdownable.